NO SHIPPING! The Rescue is downloadable and available as soon as you purchase. The Rescue: Discovering How the Gospel Rescues and Redeems Us unpacks this new reality in a powerful way. The Rescue gives your students a comprehensive and transformative view of exactly what the Gospel is, how it radically changes their lives, and how their lives will, in turn, be used to change the world. 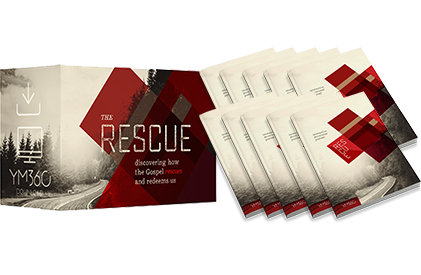 The Rescue gives your students a rich, in-depth view of the Gospel and its impact that many of them have never seen before. Using a unit-based approach. Purchase the Rescue Curriculum Devotional Bundle and give your students a premium devotional experience that helps them grow deeper in their study of God's Word alongside your lessons each week. Includes Curriculum + 10 Devotional Journals to get started with options for adding more! You'll get 3 weekly devotions to post on social media, your blog, or church website ... or purchase our The Rescue Devo Journal and watch your students grow deeper alongside your lessons weekly!